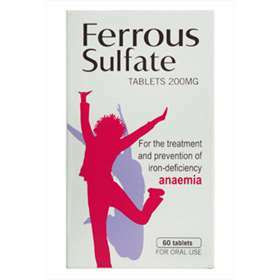 For the treatment and prevention of the iron-deficiency Anaemia. Contains the equivalent to 65mg of ferrous iron. Tablets are sugar coated and easy to swallow. Bottle is child safety capped. 60 tablets in a pack. 2-3 tablets to be swallowed throughout the day, equal spaces apart. To prevent anaemia: take only 1 tablet per day. Children weighing over 22kg - one tablet per day, children weighing over 44kg - 1 tablet twice a day, children weighing over 66kg - take 1 tablet 3 times a day. Children under 6 years or weigh under 22kg - Not recommended. Each sugar coated tablet contains 200mg dried ferrous sulfate equivalent to 65mg of ferrous iron. Spray Dried Liquid Glucose, Stearic Acid, Magnesium Stearate, Microcrystalline Cellulose (101) (E460), Lactose Granules Containing Lactose, Maize Starch, Pregelatinised Maize Starch, Purified Talc (E553), Acacia (E414), Gelatin, Sucrose, Titanium Dioxide (E171), Beeswax, Yellow Carnauba Wax, Polysorbate, Sorbic Acid (E200), Shellac Glaze, Iron Oxide Black (E172) And Propylene Glycol (E1520). Please note that packaging and brands may vary dependant upon availability.